If you are interested in unique, personalized crystal trophies, you are in the right place. Maybe you need to get sports trophies to award winners at school competition. Or maybe you are a sports club manager and you organize a meeting and have to find personalized awards for winners. Perhaps you have to find medals for coming games. All these products you can find in our offer. We are sport lovers, and this is why we decided to create exceptional crystal sports trophies. Crystal engraved glass awards are perfect for any discipline. 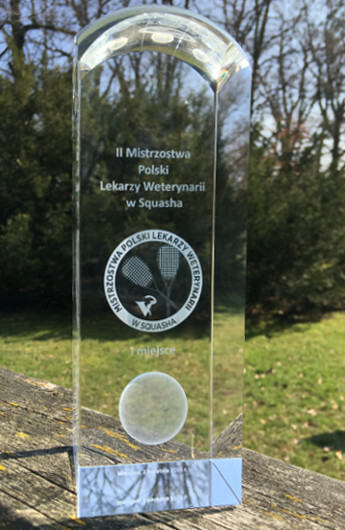 You can decorate a squash tournament winner with a crystal medal, think about personalized crystal awards for a table tennis round winners, also golf tourney is a great occasion to hand engraved glass trophies. And finally, you might want to decorate swimming match victors. These are only a couple disciplines mentioned among many others, where personalized crystal trophies can be used. Actually there is no limitation where to use engraved personalised crystal awards. A glass trophy – what about its form? sports gadgets in glass – as souvenirs or game mementos for all players, e.g. : crystal pendants. When can we apply 3d engraving? All sports statuettes and other sports gadgets in crystal can have 3d engraving (e.g. a discipline symbol), as long their depth is adequate. Additionally, your inscription can be converted to 3d format (unless it is a key ring or other small form, and 2d to 3d conversion will not be seen). How to choose and where to order? At the beginning we want to recommend to check our sports trophies section. There you can find a wide range of sports crystals shapes which you might be looking for. But if none of our crystal decorations is appropriate, please, give us a call or text us -> our advisors will tailor the offer for your needs. All crystal trophies, statuettes and medals are being engraved in Wrocław, Poland. We work, however, based on our on-line shop and there is no problem to ship your order to any place you wish. You will be sent our offer back in 24 hrs (in most cases), and if we need to clarify some details, we will be in touch with you to make sure about your expectations.